When you consider the history of motion pictures, certain watershed films leap to mind -- productions which have left their mark on the craft. Without a doubt, one of those is Stanley Kubrik's 1964 masterpiece, Dr. Strangelove (or, as it's subtitled, How I Learned to Stop Worrying and Love the Bomb). As political satire, few movies -- even those as incisive as the hilariously vicious 1992 release Bob Roberts -- come close to this level of accomplishment. In the case of Dr. Strangelove, the barbs and quips (both subtle and obvious) hold up as well today as they did thirty years ago. When director Stanley Kubrick decided to adapt Peter George's thriller Red Alert for the screen, he recruited the author to help with the script. Instead of retaining the straight tone of the book, Kubrick wanted to try for a black comedy, and with the complicity of George and co-writer Terry Southern, Dr. Strangelove was born. Originally, Kubrick envisioned Peter Sellers playing four unique roles. However, after filming three of them (President Merkin Muffley, RAF Group Captain Mandrake, and ex-Nazi scientist Dr. Strangelove), the actor broke his leg and was unable to complete the quartet. In his place, Slim Pickens was signed to portray Major "King" Kong. Other cast members include George C. Scott as General Buck Turgidson, Sterling Hayden as General Jack D. Ripper, and James Earl Jones (in his first film role) as Lieutenant Lothar Zogg. The film opens with a deranged General Ripper declaring a "Code Red", sealing off his airforce base, and ordering a nuclear attack on Russia. When his assistant, RAF Group Captain Mandrake, advises moderation, Ripper replies that he intends to launch a pre-emptive strike to stop a Communist infiltration which is "sapping and impurifying all of our precious bodily fluids." In Washington D.C., an emergency meeting is called to determine how to react to the crisis. Present are President Merkin Muffley, a man whose effete personality is adequately described by his name; General Buck Turgidson, whose least favorite color is red; Dr. Strangelove, an ex-Nazi scientist who is now head of the United States' weapons development program; Soviet Ambassador de Sadesky (Peter Bull); and the rest of the higher-uppers at the Pentagon. Meanwhile, aboard the bomber "Leper Colony", we are introduced to the crew that will play a vital role in the events about to transpire. Led by Major "King" Kong, an old-fashioned, gung-ho cowboy type (complete with hat and Texas accent), these men are as loyal and anti-Communist as they come. As a story chronicling the potential countdown to humanity's end in a nuclear fireball, Dr. Strangelove is tightly-plotted and well-paced. As a black comedy, wielding a wit sharper than honed steel, the film is unparalleled. Kubrick's picture has so many targets that it's difficult to know where to begin. Certainly, the "balance of power" nuclear deterrent policy gets the most obvious jabs (although ardent supporters may not see this -- Dr. Strangelove's attacks are subtle enough that it's possible for an unsophisticated viewer to miss the point). Parodying the "missile gap" at the heart of the arms race, we are given the "doomsday gap" and the "mine shaft gap." Kubrick isn't especially kind to the military mentality, as personified by General Turgidson (elements of Scott's performance here foreshadow how he would approach the role of Patton in the 1970 movie that earned him an Oscar). Turgidson sees Soviet plots everywhere, flirts with a girlfriend in the midst of a national crisis, believes 10-20 million American casualties (tops!) are acceptable, and wishes the U.S. had some sort of doomsday machine to match the Russians' capabilities. As the film races to its conclusion, situations become more bizarre, with a drunk Soviet Premier Kissoff whining over the phone to Muffley that the U.S. planes are flying too low and jamming his radar. Mandrake tries to put an emergency call through to the President, but the Pentagon won't accept the collect call, and he doesn't have exact change. And Dr. Strangelove, Hitler's best living ally, comes up with a plan to preserve the superior elements of humanity. "Gentlemen, you can't fight in here. This is the War Room!" exclaims President Muffley when Turgidson and the Soviet Ambassador almost come to blows. 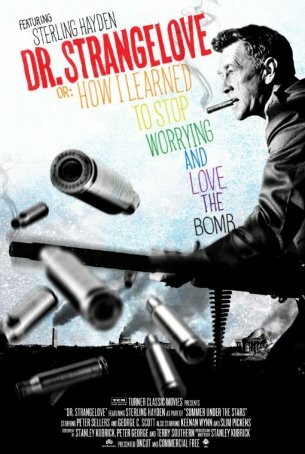 This may be the best known line from Dr. Strangelove, but it isn't the only quotable one. The dialogue often drips irony, as when Turgidson dryly observes that Ripper's ability to cause a nuclear disaster is a case of "the human element" having "failed us here," but "it's not fair to condemn the whole program because of one slip up." Then there are the character names... In addition to Turgidson, Kong, Mandrake, Ripper, and Kissoff, there's also a Colonel Bat Guano and a General Faceman. The genius of Dr. Strangelove is that it's possible to laugh -- and laugh hard -- while still recognizing the intelligence and insight behind the humor. The film is always saying something, and a viewer would have to be deaf and blind not to recognize the targets of the sarcasm. In fact, I'd worry about anyone who takes this movie too seriously. That, after all, isn't the kind of person Dr. Strangelove is aimed for; it's the kind this film takes aim at.